The Five Best Examples of Localisation: What Do Big Brands Do? Localisation is the key to establishing a global identity. When you sell a product to another market, you want it to resonate with the intended audience. Localisation is how you cause that resonance. Localisation is a process of adapting a product or service from one specific locale or market to meet the requirements of another specific locale or market. When localising you must take different cultural values into account. Some countries will resonate with one thing while other countries won’t. For example, yellow is a bright and positive colour in America and the UK but in France they associate yellow with jealousy, betrayal, weakness, and contradiction. In the 10th century, the French painted the doors of traitors and criminals yellow. Translation isn’t enough. Your market needs localisation if you want to truly adapt to it. 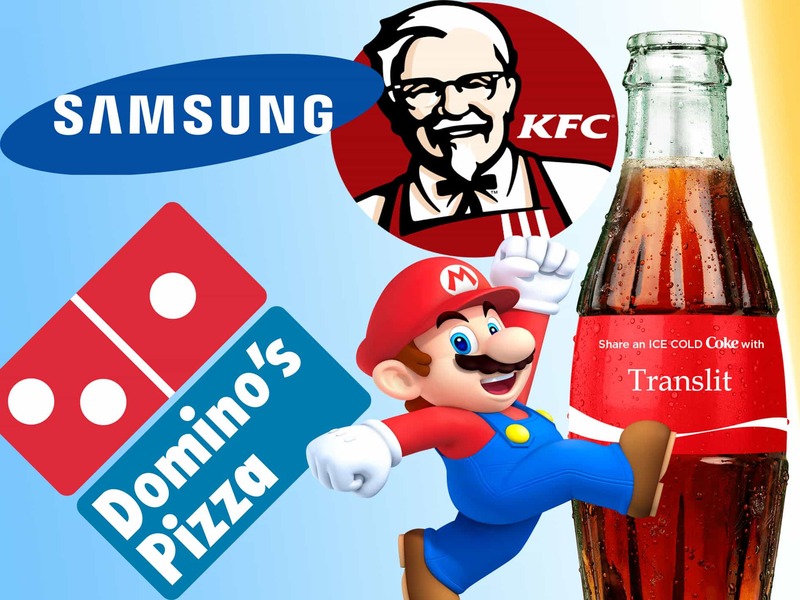 Here are five big brands who did an amazing job localising their product. Back in 2013 and 2014, Coca Cola launched their “Share a Coke” campaign. This campaign captivated the public. Instead of the Coca Cola logo on the label of the bottles there was a simple phrase: “Share a Coke with John”. But it wasn’t just for Johns, it was for Jacks, Sarahs, Bobbys. Everyone. On each coke label, there was a different name. This connected with people directly. A good example of their localisation is what they did in Ireland; adding Irish names such as Aoife and Oisín. A better example of localisation is what they did with their campaign in China. In China, it is not respectful to address a person by their first name. Usually you would address a Chinese person by his/her surname followed by honorific titles. But this whole campaign was about direct and personal connection. How do you connect with someone directly if you can’t use their first name? Coke had an answer. Instead of names, they used terms such as “close friend”, and “classmate”. This was a great way to weave through cultural boundaries while also staying true to a marketing campaign. Samsung wasn’t in the French market until 2010, competitors such as Apple, Sony, and Nokia dominated. But when Samsung decided they wanted to feature more prominently in the French market, they pierced it with an ingenious strategy. To appeal to the French people’s love of artistic integrity, Samsung arranged an art exhibition. They held it at the Petit Palais in Paris. But this wasn’t your run of the mill art exhibition. Samsung displayed works of art in high definition on their new TV sets. In its first month, the exhibition had 600,000 visitors. Couple this with their focus on promoting locally made apps, France now has a sense of ownership of Samsung. Samsung is a South Korean company, and in fact not at all French. If Samsung had just translated their marketing materials and distributed them in France, they wouldn’t have even gotten close to this success. But they applied localisation to their brand. They utilised their love and appreciation of art, making Samsung feel at home in France. KFC had an infamous localising blunder in China in the 80’s. Their catchphrase “finger-licking good” was poorly translated to “eat your fingers off”. This set KFC back in the Chinese market. But they bounced back with gusto by adjusting their menus in China. Obviously KFC is famous for it`s “Kentucky Fried Chicken”, but in China they added local foods to join the western world. Foods such as Chinese porridge, traditional Chinese breakfast breads and a variety of rice-based dishes were introduced. This allowed for mass appeal of their food. Young people would try this new American meal, while older people could focus on more traditional dishes. This spectrum of food allowed everyone to enjoy something in KFC. The Chinese had accepted them into their culture. Dominos has roughly 20% of the foreign fast food market in India. This has them above brands such as McDonalds, Subway, and Pizza Hut. But how did they get above such massive brands? It is actually quite similar to what KFC did in China. The western pizzas didn’t appeal to the Indian people. This cuisine was the polar opposite of what they were used to. So, Dominos used their ingenuity, and made the cuisine something that they were used to. They added pizzas including paneer tikka, parti parathai and Manchurian. The head of Domino`s pizza in India, Narendra Jaravta implemented these pizzas. By hiring local staff for their Indian branch, they were able to decipher what the Indian market exactly wanted. When localising this is one of the most important steps to take. In the 1980’s, Nintendo was the name you’d associate with home console video-gaming. Their prolific success lies within how they localised their content for American audiences. How did they localise? Nintendo of America used a lot of censorship for games coming in from Japan. America in the 1980s was a relatively conservative place. At the time Japan was a more socially free and progressive society in comparison to America. Nintendo of America wanted to aim the systems to appeal to families, so they removed all references to sexuality, bad language, and emotional scenes of death and loss. Nintendo dominated the home video game entertainment market in the late 80’s and early 90’s. This has also stood the test of time. Today Nintendo is seen as the wholesome developers who want to include all the family. From this you can see that localisation is vital for any company who wants to move their brand abroad. If you are in need of localisation, contact Translit today for a quotation.